The fit sample development is a major part of the product development and the success of a design depend on the fit of the product. For this reason, apparel buyers and brands control the fit development and fit sample. 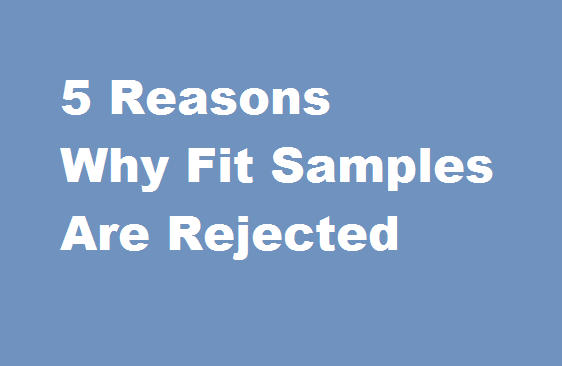 In this post, the top 5 causes of fit sample failure during the sample approval process are listed. One the obvious reason for sampling delay is fit sample failure or delay in fit sample submission. In a research study, a student from NIFT shared her finding on this topic. She has listed the most repetitive reasons for sample revision and sampling delays after studying one and half year's sampling delay data and fit rejection in a leading buying house. Followings are the top 5 reasons for sample approval failure in apparel supply chain. #1. Poor workmanship: The workmanship done by the tailor is not up to the mark or not matching with the buyer specification of workmanship. #2. Lack of understanding between the buyer and buying house: Sometimes the sample development team (either in the buying house or in a factory) starts developing fit sample without understanding the buyer's requirement completely. Sometimes merchandiser or the sampling technician don't understand the specification and develop the same based on their own understanding. As a result, the sample doesn't meet the buyer requirement. #3. Non-availability of the actual trims and fabrics: Unavailability of actual trims and fabric cause the delay in sampling approval process. Even, the factory may develop the sample with the existing matching fabric quality and trims. This exercise may not meet the buyer's requirements. #4. Late comments from the buyer: A buying house or a supplier does not always do the delay. It is also observed that buying houses or the supplier factories get buyer comment later than the scheduled time. #5. There is no defined checklist from buyer's end: In every submission, different comments are received from the buyer on the fit sample. The comment that can be given on the first submission, comes in the following submission. This leads the further need of sample development and sample correction. In case you are facing the similar challenges in sample approval delay and sample failure in different stages of sample development, you need to find the root cause for this. and take action according to the root cause. Prepare standard operating procedures for sample development for fit sampling as well as other samplings. Buyer to buyer garment sample submission and approval criteria might be different. But if you know the primary reasons for sample rejection, you can deal with some variations. Also read: How Sample Approval Delay Effects in Shipments of Export Orders? Why apparel buyers reject fit samples.